Theresa May’s desperation to be seen as a strong home secretary is apparent in how badly the banning of Islamist thugs Muslims Against Crusades has been handled. When Theresa May banned Muslims Against Crusades (MAC) her motivation was clear – to prevent Remembrance Day being marred by a deeply unpleasant stunt. Unfortunately, her desperation to be seen as a strong home secretary – likely to counter days of coverage on the immigration checks debacle – is apparent in how badly this has been handled. Firstly, last night’s Question Time showed many people are concerned that MAC appears to have been banned simply for being unpleasant and provocative, not (as was the case legally, if not politically), because MAC is the latest front for an organisation previously banned under the Terrorism Act. Secondly, it has actually done little to curb the group’s activities. The Home Office’s list of proscribed terrorist groups (pdf) makes clear MAC is simply the latest name for al-Muhajiroun, which was previously banned for its proven links to inciting (and fund-raising for) terrorism. 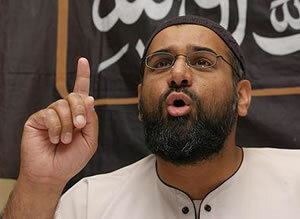 This group, which was established by Omar Bakri Muhammad but is currently led by Anjem Choudary (pictured) is also banned under the names Islam4UK, Call to Submission, Islamic Path, London School of Sharia, Al Ghurabaa and The Saved Sect. As the law is currently being interpreted and enforced, it appears MAC could simply rebrand itself as ‘Shariah4UK’ or somesuch and recommence its antics tomorrow. Moreover, the government has done nothing about other fronts for MAC/Islam4UK/al-Muhajiroun which are currently in operation, albeit rather more discretely. They typically present themselves as mainstream Muslim groups so as to book rooms – often in council-run or funded premises – and organise seemingly innocuous meetings at which they can attract new recruits. These fronts are no less illegal than MAC – they have the same members, leadership and ideology as the previously banned groups – but tactically avoid generating media coverage to avoid disruption to their activities. Likewise, Anjem Choudary has been operating the ‘Centre for Islamic Services’ (CIS) from a building in Whitechapel owned by his big brother (Yazdani ‘Dani’ Choudary) for well over a year . Tower Hamlets council even allowed CIS to advertise in the council ‘East End Life’ paper for several months. Moreover, this week’s Private Eye reveals Dani Choudary – in his capacity as owner of a company called ‘Master Printers’, which shares premises with CIS – is now a signatory to the council’s ‘No Place For Hate’pledge. But the government appears to have done nothing about CIS (or the council’s incompetence) even though the centre’s true nature was exposed back in April. Nor has the government done anything about ‘Salafimedia’ – a website used by MAC and many of its predecessors to distribute militant propaganda, such as messages from the now-deceased al-Qaeda propagandist Anwar al-Awlaki. What is most remarkable about May’s weakness on this issue is that her party’s 2010 manifesto contained a pledge to ban Hizb ut-Tahrir (HT) – the anti-Semitic, homophobic and deeply unpleasant (but non-terrorist) group from which al-Muhajiroun branched off in the early 1990s. Now is the time for Labour to direct a similar question back at Cameron. Forget the ill-judged and probably impossible promise to ban HT – why does the government persist in playing low-speed whack-a-mole rather than taking effective action against HT’s militant offshoot, whatever it chooses to call itself? Now you ban them for arguing about invasions of countries that have Oil. The UK the land of where you can say what you like when you like so long as it not religious or political or on race. I do not agree with these people but I dam well argue they have a right to say it.